Designed by BlueSky Boatworks and built by Jackson Kayak in Tennessee. Now you're ready to fish big water - lakes, rivers and oceans, OR fish the small water; like ponds and creeks. Speed for covering distance with an awesome FlexDrive pedal drive or by paddle and TONS of stability for standing. The 360 Angler and 360 Escape will slide right into your pick-up truck or trailer. Integrated fold-up wheels let you roll right across the parking lot full of gear to the launch site. Angler-designed deck for logical tackle and rod storage. Of course we wish the best fishing was close by our launches, but it's often not the case. That's why designed the 360 Escape and 360 Angler for a full day out on the water. The hull and the for and aft decks are designed for both stability and moving around on. This, with the addition of storage areas, gear tracks and more allow you to customize for your style of adventure. Add a camera mount, smart phone, tablet, fishing rod holder, cup or your favourite Bluetooth music player. The Riviera is quite possibly the easiest to use kayak on the market, and just plain FUN to Paddle. The Rivera was inspired by a group of outfitters who wanted a kayak that was very stable, easy to paddle, comfortable, required no maintenance, and fit paddlers of almost any size. These same features make the Riviera just the ticket for those who want an easy to use, hassle-free kayak for cruising, fishing, or just having fun on the water. Cottagers will find the Riviera ready for all kinds of water frolic. From solo paddles around the dock to long expeditions, the Riviera tracks very well and gets you from point A to Point B with speed and comfort including an ergonomically designed built-in seat and adjustable foot holds to make this a craft for all to simply relax in around the lake. Adventurers hoping to get out there for that exploratory trip across the lake, into marshlands and down a coast, its amazing where the Riviera can take you. The Jackson Kayak fishing team started out in the Riviera since the back deck was perfect for fishing gear and adding rod holders was easy. 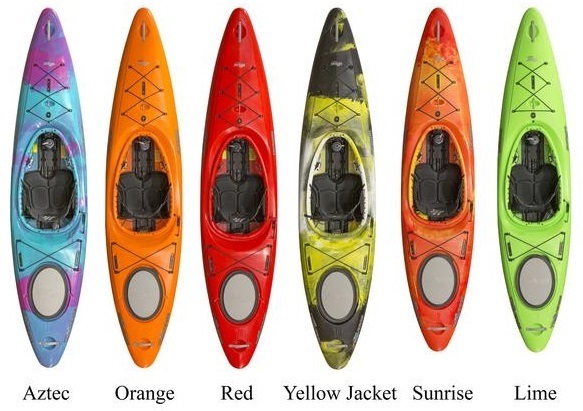 Liveries and Outfitters and Boat Rental Companies are often frustrated by kayaks with too many fragile parts, too heavy, difficult to maintain and impossible to store. The Riviera was built to make life easy for professional liveries, outfitters and beach and park concessionaires. With no moving or fragile parts, strong plastic molding and stackability, the Riviera is the perfect rental craft for your business. Jackson makes the Cruise in 10ft and 12ft sizes. They're a good stable craft so we frequently add tracks, cupholders, camera or Go-pro mounts to them for our customers. Traction pads and rod holders may also be added for paddlers who also like to fish. 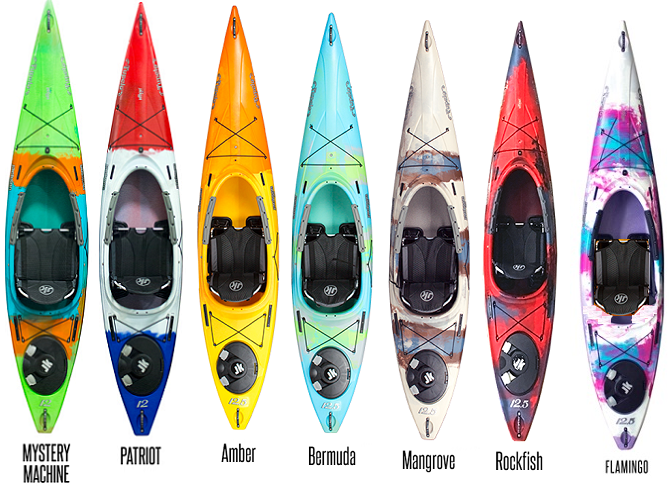 Cruise has the smaller size of a versatile, general purpose recreational kayak. Jackson Kayak's signature feature is the Elite Hi-Lo Seating concept. This is really comfortable and makes it very easy to get on and off the kayak at any shoreline, regardless if you have a dock. Come on in, and we'll show you how it works. Cruise is a great sit-on-top you'll love to paddle. No-skid floor pads are easily added. 8 inch gear tracks are easily added for more accessories. Our Cruise Angler has flush mount Rod holders in place of two of these inserts and a RAM Rod holder for another. Designed to big enough to fish big water - lakes, rivers and oceans. Small enough to fish the creeks and backwaters. There's speed for covering distance and stability for sitting OR standing. You'll notice the Angler-designed deck layout for logical tackle and rod storage. 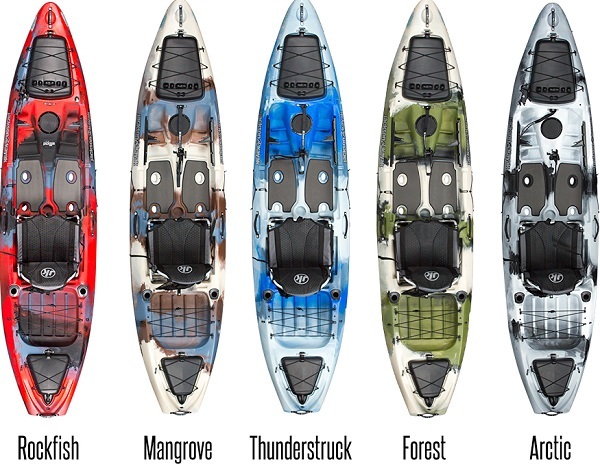 The Cuda HD is the evolution of Jackson Kayak's all-time top selling Cuda kayak series! Jackson Kayak has taken all the recent improvements to both hull design and deck staging and added it to this new product. A new longer and slightly wider size gives the Cuda HD additional stability, tracking and speed. YakAttack tracks in all the convenient places, Hi-Lo and trimible seating and comes Raymarine ready and PowerPole ready! 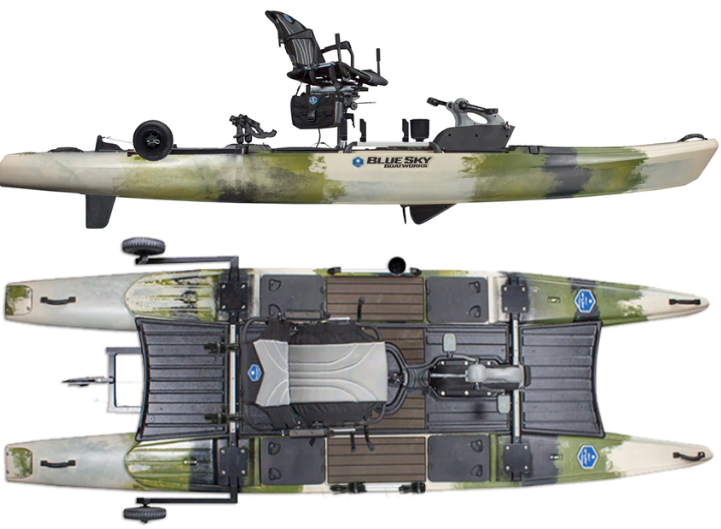 This kayak is designed for some of the most challenging paddling environments in the world and intended for the offshore and big lake kayak angler.This kayak marks the first collaborative design between legendary kayak angler, Jim Sammons and Jackson Kayak's design team led by Tony Lee. The end result is a boat shaped and built to accommodate those hitting the open water, those looking for speed, comfort, perfect trim and big water management. It's a paddlers fishing kayak! It's designed for punching through surf, handling rough offshore currents, swells, beach landings and those who desire ultimate performance when paddling long distances to get on big fish. Jackson Kayak's top design team once again teamed up with pro kayak angler Drew Gregory to put an "HD" twist to the already popular Coosa model. This heavy duty fishing craft boasts amped up specs/features and is slightly longer and wider than the original Coosa; this makes it even more stable and a perfect fit for anglers of all sizes or those who are really looking for a stand up fishing kayak. The hull is still river friendly, but the HD will track truer on the flat waters of lakes or inshore saltwater. Packed with features the Coosa HD is ready for any type of fish on almost any type of water! The MayFly is a fly fishing oriented sit-on-top, loaded with features to make kayak fly fishing more fun and user friendly. including tropical flats, slow-moving rivers, lakes and ponds. the MayFly includes a myriad of design aspects to address the needs of fly fisherman creating the ultimate kayak fly fishing platform. while being versitile and stable enough to bring new kayak fly anglers into the sport. The Big Rig is a fishing kayak that's designed for incredible stability while you stand-up OR sit down. 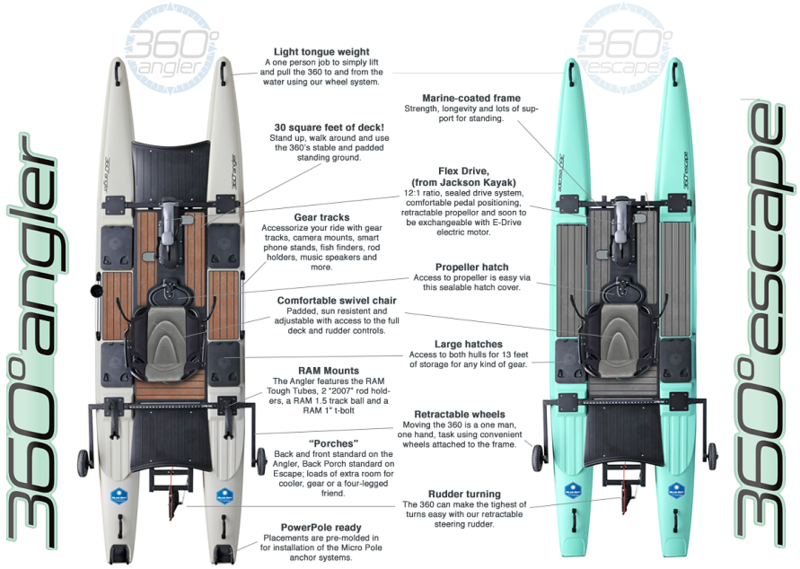 Taking the best features of various Jackson Kayak fishing models into a new, larger package, while introducing some new ones at the same time to create the ultimate all-water, all fishing style, fishing machine. The Big Rig comes ready to accept the Raymarine Dragonfly fishfinder and Power-Pole Micro stake out systems. 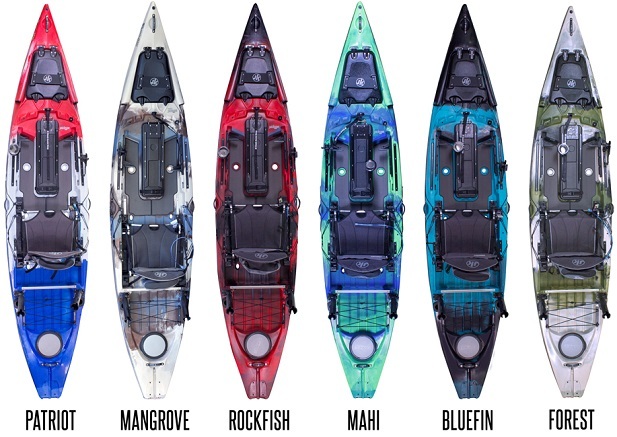 If you are thinking about a fishing kayak you could stand up on we invite you to our store to try a few out since it can be very enlightening. Many kayaks these days are claimed to be good for standing but we find that often does not hold true. While we see a few people every year that seem to have just returned from the Olympics -and are therefor able to stand on anything and look awesome. We've found that for most of our customers it's a big deal which of these models they try to stand upon. The Jackson Big Rig should be on your list of stand-up-able fishing kayaks; it's very sturdy. Our Big Rig package includes hatches, rod holders, rod tip protectors, traction floor pads, pull-up strap, adjustable Hi and Low seat levels AND a retractable stand-up Bar other brands add $200-300 for that! Notice all the threaded inserts and gear tracks molded into the deck -so you can add rod holders and other accessories anywhere you could want. Theres a great spot for a cooler or a krate right behind the seat, plus under seat storage and lockable bow and stern hatches. The Big Tuna is our largest capacity fishing kayak with the ability to paddle either as a tandem or a solo. It has many different seating positions like "facetime" positions. Its JK stability, logical accessory positioning, rudder option, and speed make it a serious predator in all water types. The Big Tuna is a creature unlike any other on the market, with multiple never before seen features in the kayak fishing world. Leading the charge on these unique elements has to be the "Tuna Tank," a unique bait/live well that requires no plumbing or electronics! It utilizes the water from beneath the boat to circulate into the bait tank keeping fish lively and fresh unlike any other system on the market. The tank also resides in the center of the boat for easy access and management. The possibilities with the Tuna Tank are endless - bring the kids on a trip and have them catch cool creatures and learn about them while in the tank; keep your catch alive to show it off to your friends later before you release it; keep your live bait alive and fresh; insert the cooler option to put your fish on ice or just use it as a cooler for your drinks; insert the solid piece and use it as dry storage! Tupelo is designed for cruising the waterways with comfort and efficiency. With loads of storage and convenient accessories always within reach; Tupelo is your premier, feature laden kayak. The 12.5 size is higher volume craft with a bit more length width and depth. The seat in the 12.5 is elevated above the floor in order to providebetter a ergonomics while paddling. The smaller, lighter, narrower 12.0 has a lower seat and also a lower deck. The 12.0 is very light and efficient. We'll bet that if you only sit in one size you'll love it, but we'll encourage you to sit in both sizes, just to be sure which one fits You best. This sizing allows a couple who are not matched in size or strength to paddle at a similar pace, without one feeling they must work harder than the other. Our customers say Tupelo blurrs the line between Touring and Recreation since they are more stable and more comfortable than most kayaks while also being more efficient than most kayaks. All while being very easy to keep going strait AND easy to turn! Both sizes feature Jackson's removable and super comfy Elite Seat. YakAttack tracks around the deck allow for you to accessorize with many RAM or Scotty accessories like fishing rod holders, GPS, camera mounts, smart phones, cup holders and more. It's ideal for long trips or just relaxing out on the water. Versatility, comfort, ease of use.... Tupelo has it all! Tupelo 12.0: Length:	12' | Width: 27" | Height: 14" | Weight: 42 lbs. Tupelo 12.5: Length:	12' 6" | Width: 29" | Height: 16" | Weight: 49 lbs. 12ft only 35 lbs !! The Tupelo is now available in our LT Edition thermoformed material for ample durability while being super easy to cartop. The Jackson Kayak Tupelo is a popular light touring/recreational kayak aimed at getting you out for adventures. This fast tracking, comfortable and easy to use kayak is great for beginners and more advanced paddlers. This is the kayak that will make all your friends want to upgrade too! The deck is fully outfitted with bungees and YakAttack Tracks that can hold Scotty or RAM accessories such as a cup holder, Go Pro or camera mount and Fishing rod holder. Check out the ample storage with its stern locking hatch with a sealed bulkhead. Includes our new ergonomic Elite Seat. Tupelo LT: Length:	12' 2" | Width: 28" | Height: 14" | Weight: 35 lbs. Designed for the touring paddler who seeks out a boat to champion themselves into the next levels of their adventures. The Journey offers speed, stability and comfort for paddlers looking to push their adventures to greater heights. This kayak utilizes best-in-class design techniques in edge control, comes Smart rudder ready and is equipped with our JK outfitting; comfort and performance rarely found in 14 foot type touring boats. Whether you are paddling just for the day or for several days, the Journey is fantastic. • Sit-in-kayak that keeps you high and dry. • Intuitive layout of protected gear positions, rear hatch with a sealed bulkhead. • Hard deck (standard) and soft deck (optional) for more protected gear storage. • Leave off the Hard deck and soft deck for an open concept layout. • Jackson's ELITE Hi-Lo Seat makes this one sit-inside kayak that's EASY to get on or off. • The Best features of a sit-on-top style kayak combined with the Best features of a sit-inside style kayak! The Kilroy is quickly becoming the talk of the fishing/hunting world as one of the most decked out kayaks on the market, especially for those who don't relish getting wet. 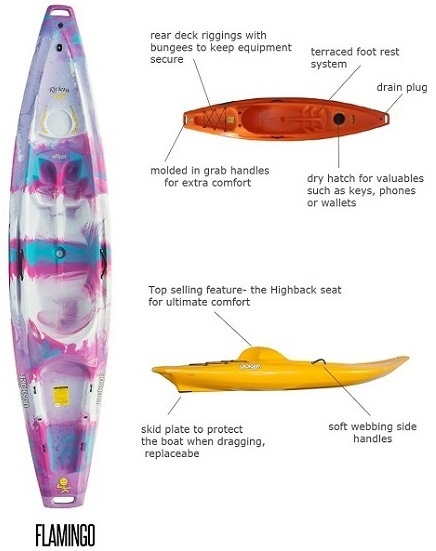 With logically placed gear mounts and staging systems all in a protected hull, this is a great kayak for those who want the typical JK set up innovation in a sit-inside. The Hard Deck or the Soft Deck shown on our KilRoy can be removed, so the cockpit appears much larger (as in our Tripper photo). • Intuitive layout of gear positions, rear hatch with a sealed bulkhead. • Hard deck (optional) and Soft deck (optional) for more protected gear storage. • Leave off the Hard deck and Soft deck options for an open concept layout. Based on the incredibly stable, fast and versatile Kilroy hull, this sit-inside recreational kayak design for exploration fun and family adventure. The Tripper 12 comes with loads of storage space, our comfortable patented ELITE Hi-Lo seat and unending ways to set it up for your on-water use. Stuff it for a long adventure, load it up for fishing or simply take it out for a leisurely paddle, the Tripper will get you there. We say Traverse but the full name is Karma Traverse. Karma Traverse -because these yaks are designed to do everything you'd do with our Karma BUT more! The Karma Traverse is a do it all whitewater-crossover kayak we make in two sizes for versatility and great perfomance with just about any size paddler. Jackson design team gives you groundbreaking speed and hard-carving edges while maintaining our tradition of easy-paddling designs. Traverse is fast, stable, and easily boofs over anything in its way. The planing hull makes it impervious to boils and cross-currents while the narrow bow-shape softens the landings. This fast yet friendly design gives paddlers of every skill level the confidence to push the clock or just your limits. ✔ Check out the huge hatch and sealed bulkhead for safety and awesome gear storage. ✔ Cruising big flat stretches on the river or even lakes are no problem thanks to the on-demand retractable skeg. The Karma is a creek style play boat we make in three sizes for primo perfomance in the knarliest or the knarly runs. The latest Creek Boat from Jackson Kayak takes a big leap forward to give you groundbreaking speed and hard-carving edges while maintaining our tradition of easy-paddling designs. The Karma is fast, stable, and easily boofs over anything in its way. The planing hull makes it impervious to boils and cross-currents while the narrow bow-shape softens the landings. This fast yet friendly design gives paddlers of every skill level the confidence to push the clock or just your limits. With the No Holes construction for a dry ride and a Uni-Shock bulkhead to protect your ankles and your investment. Available in 3 KARMA sizes, the S, M, and L.
The ZEN is a river-play-creek style boat we make in three sizes for the best perfomance in the all waters. The new in 2015 Zen bridges the gap between river runner and creek boat and offers a new tier in speed and performance. The sidewalls are higher than the previous model giving it much improved stability. The added volume and bow rocker keep you higher on the surface. The Zen has held onto its fast, light maneuverability but now allows you to fly up and over rocks, holes and waves better than ever. Whether you are looking for a forgiving, easy to roll all around kayak while just getting started or wanting a sporty river runner that surfs as well as it creeks, the new Zen is for you. This new hull design will make the Zen a forgiving kayak for those rolling, bracing and running whitewater for the first time. Making it not only an awesome instructional kayak but a top creek racer as well. The end result will be a Zen that is fast, stable and more versatile than ever on rivers and creeks. Available in 3 ZEN sizes, the S, M, and L.